There's disagreement over whether the "hundreds" to "tens of thousands" net migration claim was a Conservative 'target' or just an 'ambition'. It's also been referred to as a government target, although the Liberal Democrats have repeatedly insisted it wasn't a Coalition government policy. There's little coherence across government documents and speeches by ministers to shed light on this. Official sources suggest it's a target in all but name, although one not recognised by the Liberal Democrats. In the 2010 Conservative manifesto it was stated that "we will take steps to take net migration back to the levels of the 1990s—tens of thousands a year, not hundreds of thousands". But the Conservatives didn't win the election and the Coalition agreement contained no reference to a target to reduce net migration, although it said the government wanted to reduce the number of immigrants from outside the EU, without any specific numbers. 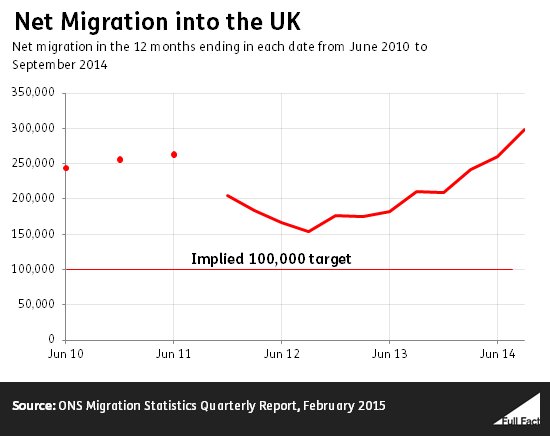 So much for the net migration target? Not quite. Home Secretary Theresa May said in a speech later in 2010: "We will reduce net migration from the hundreds of thousands to the tens of thousands." "set an annual limit on the number of non-EU economic migrants admitted to the UK, reducing annual net migration to the tens of thousands". "set an annual limit on the number of non-EU economic migrants admitted to the UK. As a result of this and other policies we anticipate net migration will be in the tens of thousands in future". Net migration stood at 298,000 in the year to September 2014—three times the 100,000 maximum implied by the 'tens of thousands' claim.